Have you seen Pixar’s new movie yet? My kids recently went to the movies to see the movie Inside Out and LOVED it. 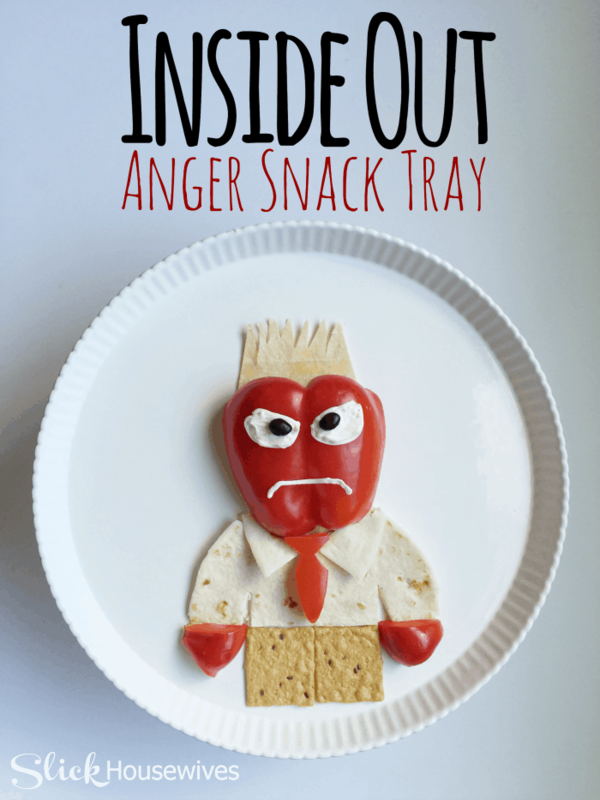 This Inside Out Anger Snack Recipe will help you celebrate the new flick. Inside Out not only looks like a great movie but I read that the director modeled it after his experience with his own daughter. Cut your red bell pepper in half removing the seeds. This will become ANGER’s face. Place your softened cream cheese into a ziploc bag and cut a small hole in one corner of the bag. Use the cream cheese to pipe ANGER’s frown and eyes onto the bell pepper. Place two canned black beans on the white cream cheese eyes to form pupils. If you have black food coloring you can tint a small amount of cream cheese black and pipe on for the same effect. 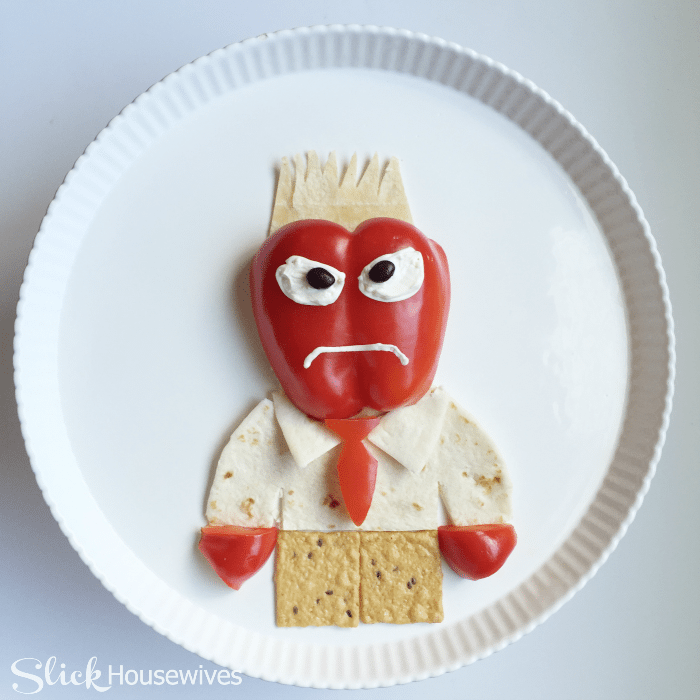 Using the red bell pepper face for a guide, and with a sharp knife, cut your corn tortilla to form the fire coming out of the top of ANGER’s head. Cut your flour tortilla in half. This will become ANGER’s shirt. With the lip of a cup turned upside down, cut a neck opening on the rounded edge. Place under ANGERS chin. Cut the flat side of the flour tortilla to form the arms. Cut each shirt collar side from the reserved tortilla piece you removed with your cup’s lip. Place under ANGER’s chin. From the other half of your red bell pepper, freehand ANGER’s tie with a sharp knife. Cut two rounded edges from the remaining red bell pepper for ANGER’s fists. Place two crackers under ANGER’s shirt to form his legs. See below for a printable recipe! Cut your red bell pepper in half removing the seeds. This will become ANGER's face. Place your softened cream cheese into a ziploc bag and cut a small hole in one corner of he bag. Use the cream cheese to pipe ANGER's frown and eyes onto the bell pepper. 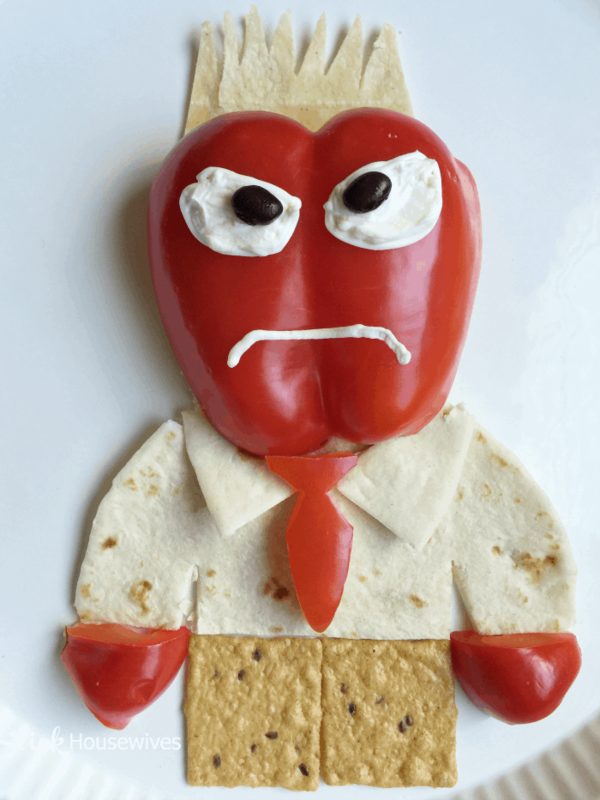 Using the red bell pepper face for a guide, and with a sharp knife, cut your corn tortilla to form the fire coming out of the top of ANGER's head. Cut your flour tortilla in half. This will become ANGER's shirt. With the lip of a cup turned upside down, cut a neck opening on the rounded edge. Place under ANGERS chin. Cut each shirt collar side from the reserved tortilla piece you removed with your cup's lip. Place under ANGER's chin. From the other half of your red bell pepper freehand ANGER's tie with a sharp knife. Cut two rounded edges from the remaining red bell pepper for ANGER's fists. Place two crackers under ANGER's shirt to form his legs.